The first teeth veneers were invented in 1937 by Charles L. Pincus (1904-1986). It was used as a temporary measure on Hollywood stars shooting a film and fell off after a while. Yet, they fulfilled their intent. As the first dental veneers, these objects helped early Hollywood actors maintain their impeccable smiles. The problem was the adhesive, it was not strong enough for his needs. The right glue to hold porcelain veneers (sometimes misspelled porcelin veneer or porcelain vaneer) in place appeared in 1982. 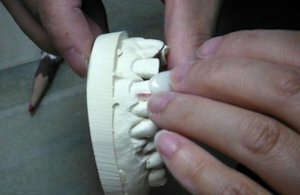 In that year, R. J. Simonsen and J. R. Calamia informed the dental community of the ability of etched porcelain to bind completely to the tooth with composite resins. H. R. Horn had been working on a similar process. As F. Spear and J. Holloway in a 2008 article on the selection of ceramics for veneer dentistry have pointed out, "With the advent of dentin adhesives in the early 1990s, porcelain restorations with significantly higher bond strengths than those that had been available previously became possible." These technological discoveries ensured the ongoing ability of cosmetic dentists to create long-lasting and beautiful smiles. Over the past few decades, dental technology has advanced and created stronger and more versatile materials. As well as invented much more sophisticated techniques to create veneers that look like real teeth and react to light and color the same way a natural tooth does. Dental veneers range in price. The overall cost depends upon several factors. This may even include where a person lives as well as the experience of the dentist. In 2011, the cost in the United States was between $1000 and $3000 a tooth. Dental insurance doesn't typically cover the entire cost for veneers but in some instances it may provide a partial benefit; and dental plans often include discounts on veneers. Veneers are not a necessity, but in today’s society a perfect smile goes a long way in helping maintain a sense of confidence in your personal relationships and can improve your career potential according to studies.